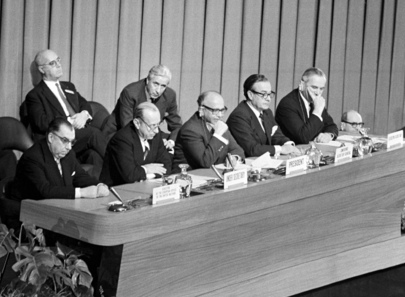 This issue was first added to the agenda of the First Committee in 1988, with India as the main sponsor. In introducing a draft resolution, the delegate recalled that increasing amounts of resources were being devoted to developing new weapon systems, which caused uncertainty and insecurity. Developments such as the graduated use of nuclear explosive power, miniaturisation and large-scale computing capabilities using micro-electronics, and fuel and laser technology were transforming the security environment. Therefore, it was argued that work should be initiated to develop a shared perception of the problems involved and to make possible concerted efforts to resolve them. On 7 December 1988, the first resolution on the issue, 43/77 A was adopted with a recorded vote of 129 in favour, 7 against with 14 abstentions. By this resolution, the UN Secretary-General was requested to follow future scientific and technological developments, especially those which had potential military applications, and to evaluate their impact on international security, and to submit a report thereon to the General Assembly at its forty-fifth session in 1990. The broad aspects of technology covered in the report (A/45/568) were determined at a consultative meeting, held in May 1989, as: nuclear technology; space technology; materials technology; information technology; and biotechnology. To assist in preparing the study, arrangements were made for appropriate experts to submit individual papers assessing the impact and military potential of developments in those fields. In addition, a high-level conference, entitled “New trends in science and technology: implications for international peace and security”, was held at Sendai, Japan from 16 to 19 April 1990, at which scientists, strategic analysts, arms limitation and disarmament experts, politicians and diplomats from over 20 countries addressed those and related issues and at which the experts’ assessments in the five specific fields mentioned above were discussed. The final report of the Secretary-General was conveyed to the General Assembly on 17 October 1990. In its resolution 45/60, the General Assembly took note of that report and agreed that the international community should position itself better to follow technological change, a requirement in which the United Nations could assist. The item has remained on the agenda of the First Committee since 1988. The General Assembly adopted a resolution on this issue for the first time since 2006 at its seventy-second session in 2017. In resolution 72/28, adopted without a vote, the Assembly requested the Secretary-General to submit a report on current developments in science and technology and their potential impact on international security and disarmament matters to the Assembly at it seventy-third session.